No 3. Portland Chimnies for the 4 prCt. Office, Old Wall (twice), Line of Wall, Stone Plinth, some dimensions given and stamped S.O. 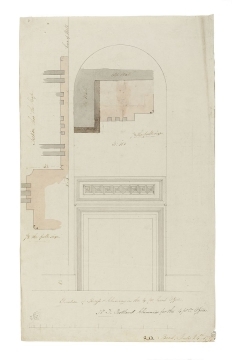 Drawing 7 is for a chimney-piece design intended for the Four Per Cent Office (directly to the north of the Rotunda). The chimney-piece elevations shows a triple-incised frame, surmounted by Greek key pattern frieze. The half full size sectional detail shows the incised frieze, marking the depth of the incision-recess back to the wall and (further up) indicating the position of the incised parts for the Greek-key pattern and surround. As a prelude to copying, the drawing has been pricked for transfer - an indication of the rational re-use of existing designs that characterised Soane's office practice.